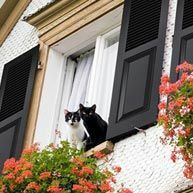 Shopping for window shutters for your home can be a difficult and time-consuming process. At Hooks and Lattice, it is our goal to make the buying process as easy and as quick as possible. Much like framing a work of art, well-chosen window accents can draw attention to an architectural opening or balance a poorly placed or sized window. 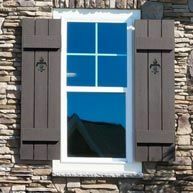 Modern home construction lends well to non-swinging outdoor shutters. Intended solely for ornamental purposes, we offer these as an easy way to boost your home's curb appeal while staying under budget. 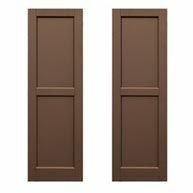 Add faux hardware to the panels, making them look like just like an operable shutter set. Hardware like faux brackets, L-shaped shutter hinges, pintels, slide bolts and shutter dogs are available to help you bring your windows to life. When making operable and decorative choices the main considerations should be functionality, style, maintenance, cost and authenticity. If you're looking for the lowest cost, easy installation and something completely maintenance-free, we recommend installing our high-quality vinyl collection, made by Mid-America. Options like these are inexpensive, lightweight, pre-finished, require no maintenance and come with a 40-year warranty. People like vinyl because the product line ships fast and most are eligible for returns, unlike made-to-order items. On the other end of the spectrum, we offer fully operable panels that are historically accurate and hurricane rated for storm protection. We bring you Atlantic Shutters, the best that money can buy. Marine-grade fiberglass carries a lifetime warranty, and their wood composite counterparts are guaranteed for 10 years by this upscale manufacturer. Both types can be mounted as "fixed" (non-swinging) or can be installed using our stainless steel shutter hardware. In between these two extremes we offer the most traditional, moderately-priced material of all. Panels made from wood have been around the longest and for good reason! 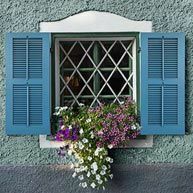 Back before windows were made of glass, they were the only way to close up your home or business, keeping the heat inside and burglars outside. Wooden options bring a charming, traditional feel to French country cottages and Victorian revivals. Optional upgrades like arched tops, diamond cut-outs and custom carvings mean that your house will stand out on the block. Personalize away with kiln-dried timber species like teak, mahogany, reclaimed barn wood, redwood and Western Red Cedar. PVC composite is perfect for homeowners who love the traditional look of colonial homes but don't want to deal with the hassles of maintaining them. Closed cell PVC composite is naturally waterproof and inherently white. If you're looking for white panels that you don't have to paint, this is your way out of maintenance - forever! Otherwise, these units can be easily painted using any high-quality exterior latex paint. Most homeowners prefer to bolt panels directly to the house, but heavy-duty hardware is available online. Each pair is constructed with steel reinforcements for rigidity. Architectural outdoor styles will look their best if they are mounted with either decorative or functional hardware items! Easy to add pieces like hinges, faux strap hinges and decorative holdbacks are fan favorites. Unique hardware types can be found as well; see clavos decorative nails, slide bolts and New York Hinge Sets. Operable or not, hardware is always a smart architectural upgrade. 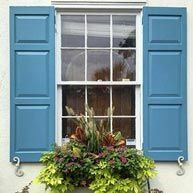 What were house shutters used for historically? 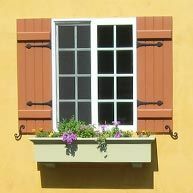 Swinging shutters were originally designed to protect the home from wind and weather. Before the advent of exterior glass windows, wooden or iron screens, which were operated from the interior, would keep out unwanted heat, pests, wind, rain, snow or intruders. Oftentimes homes would use raised panel or board and batten style on the lower level windows for security, and louvered style for air circulation near the bedrooms on the upper windows. More recently they have become more of a necessity in hurricane prone areas such as the south where new building codes are requiring either high impact-rated safety glass or hurricane rated storm-specific designs. With glass windows in tropical zones, you can never be too safe - we also offer hurricane units that meet Dade County's (Florida) rigid requirements. 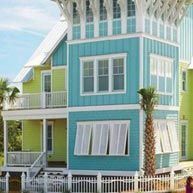 Bahama panels and Bahama-style hardware kits make installation easy and secure. Increasing the curb appeal of your house raises the resale value and makes it more appealing to homebuyers. Add instant curb appeal and choose from a variety of materials, styles and colors. At Hooks and Lattice, it is our goal to bring you the widest selection on the internet and the easiest shopping experience. If there is something you're looking for, we want to end your search here! Buy pairs online, or give one of our skilled customer service reps a call for quotes on custom orders and upgrades. We can often save you money on shipping also - call toll free to see if we can lower your shipping cost on bulk orders- 888-896-0978. Please note: Some of our products are made to order and considered "non-returnable". Please see our Return Policy section to read about each specific product prior to ordering, or call for information.